China, home to ~1.351 billion people, is ranked 101st on the United Nations Human Development Report for 2013. Their Human Development Index score of 0.699, between Jordan(0.700) and Turkmenistan(0.698), puts them on a path for growth. China falls into the "Medium" class of human development index nations, according to the UN. It would only take mild improvements for China to gain entry into the high HDI class. China created almost 10 trillion dollars (7,418 per capita) of GDP in 2011, while decreasing public spending as a share of Gross Domestic Product (2000-2011, 15.8% → 13.1%), as well as total debt service (2000-2009, 2.2% → 1.0%). Citizens of China can expect to live almost 74 years, while attending on average 12 years of schooling, improving upon previous generations who only average 7.5 years of schooling. China's Gross National Income per capita rank outsizes its HDI rank by 11, putting it 90th in the world for GNI per capita (at $7,945, 2005 Purchase Power Parity). Even better, China's Non-income HDI value is 0.728, putting it close to Kuwait (0.730) and Dominican Republic (0.726). China's rate of population growth is plateauing, having increased by 0.6% between 2000 and 2005, and only projected to grow 0.4% between 2010 and 2015. This, however, does not capture the massive urbanization happening in China over the past decade, increasing from 35.9% of the total population living in cities in 2000, to 51.9% in 2012. China is also aging as a nation, increasing the median age by 5 over the previous 10 years. China has seen mild decreases in overall fertility rate (1.7 births per woman in 2000 → 1.6 births per woman in 2012), and at-birth gender ratio (1.21 → 1.18 male to female births over the same period). China's trade continues to strengthen, though the data is somewhat difficult to interpret. Unlike elsewhere in the UN HDR where purchase power parity for 2005 has been used, statistics for trade are represented via current dollars, and GDP calculations for this section are an average of 2009 and 2010 in current dollars, making comparison difficult. For example, the UN HDR lists the total value of merchandise exports at $1,577.8bn, and constituting 28.9% of GDP, whereas using the same PPP as is used elsewhere one would calculate that to be $2,881.5bn (by using the % of GDP). Problems aside, China's trade in merchandise comprises 52.5% of GDP, with manufactured products comprising the vast majority (93.4%) of merchandise exports, as well as 60.9% of merchandise imports. Trade in services only comprises 6.6% of GDP. The Conference Board Leading Economic Index for China increased by 0.9% in February 2014, on "the back of strong bank lending"(Conference Board). Financial flows in China stay in China. Foreign Direct Investment is only 3.1% of GDP, with no development assistance received, and only 2.6% GDP for private capital flows. Remittances were just under 1% GDP. China is, however, seeing an outflow of people, with 0.6% of the population emigrating in 2010. There are at least 100 million migrant workers in China, many of which are not registered in cities and thus lack some of the formal protections granted to registered migrant labor. 72.5% of those migrant workers are owed wages (Hart-Landsberg, 27). China is 35th in the world for Gender equality, just between the United Kingdom and Latvia. Their national parliament is 21.3% female (compared to 17% for the US Congress). Progressive as that is, there is still progress to be made, with 70.4% of males over 25 having secondary education and only 54.8% of females, and similarly for labor force participation where men over 15 have an 80% labor force participation rate whereas women are only at 67.7%. Only old data was available on poverty in China, where 12.5% of the population counts as being in some form of poverty (in 2002). Those vulnerable to poverty numbered 6.3%, and those already in severe poverty numbered 4.5%. Additionally, 12.5% of China's population was under the Purchase Power Parity $1.25/day income level, and 2.8% below the official national poverty line. China's economy is powered by 11.9% renewable energy (and 87.4% fossil fuel), generating 7032 megatons of CO2 in 2008. What's more concerning is that China is depleting their natural resources at a rate of 5.1% per year, and have deforested 31.6% of their forested land in the past two decades, and withdrawn 19.5% of their fresh water in the last decade. The UN HDR cites that the overall loss in China's Human Development Index due to inequality is 22.4%, which is huge. The overall satisfaction with life is 5/10, but satisfaction with freedom of choice and job are 77% and 69.9% respectively. 57% trust other people, 77.1% are satisfied with their community, and 80% perceive themselves to be safe in their community. Technology-wise, China spends 1.5% of GDP on Research and Development, employing 1200 people per million as researchers. 99.4% of Chinese have electricity, 5.7% have a PC, 34.4% are Internet users, 9.4% have broadband in their home, and 86.2% have a telephone plan. The challenge going forward for China will be getting all of the rest of the population online, further closing the gender gap, increasing R&D spending, reducing poverty sharply, while dealing with an aging populace. This would be a tall order for any nation, not least one growing at between 8 and 10 % per year. China's public debt has been decreasing as a share of GDP (38% →31%, 2011 →2012) after having grown from 2000 to 2011, but is still huge. Local governments published their reports in January of what their debt looked like, and all told the local-government public debt figure for China is ~$3T USD. Most of the loans to local governments are executed by China's 4 state-owned banks. China's current account balance in 2013Q4 was 498bn USD (up from 403.77 in Q3). Their balance of trade was +2,613.61bn USD in 2013. These type of numbers (with local government debt reaching 75% of GDP in some regions) are staggering, but they're exactly what Xi Jinping's regime is addressing. I expect government debts to decrease over 2014, and the IMF projections that GDP (though it faltered in 2012 and 2013) will rise slightly (7.5% to 7.7%, 2013 → 2014). However, even $3T in public debt pales in comparison to the US's $17T of public debt, in absolute terms. However, as a share of GDP, ~30% (China) or 71.8% (USA), China is still doing fairly well. Much (69.6%) of China's external debt is short term (as of 2011), and that has expanded quickly between 2000 and 2011, where it expanded from $13,080m USD to $476,911m USD. As well, a small amount (~10bn) of IMF credit was taken on sometime during 2009 reporting period. The debt in 2011 was composed of 86.5% USD, 6% Euro, 6.1% Japanese Yen, showing a strong bias towards USD-backed debt. Interest payments on long term external debt are growing YoY, but remain primarily private non-guaranteed debts. China's external debt stocks for public and publicly guaranteed debt is $74,003,757,000 for 2012. This is slightly down from 2011, and significantly down from 2010 (75,176,260,000 and 90,636,668,000, respectively) Their external debt stocks for private, non-guaranteed debt in 2012 was 159,670,510,000. Private, non-guaranteed debt jumped from 110,847,088,000 to 147,415,700,000 between 2010 and 2011. China also held $1.6T USD of US government debt as of June 2012, which was reduced to $1.2735T USD by Jan. 2014 (Morrison, 2). China paid $7,916M USD in interest on public loans in 2011, up from $6,291M in 2010. Of that, $2,797M was interest on public debt. Principle payments constituted $39,320M USD in 2011, up from $29,511M USD in 2010, on $197,776M outstanding long term debt stocks. Of that, $13,250M was public debt payments. None of China's debt (as of 2011) has been restructured. There has been coverage in the last month of the economic restructuring Xi Jinping has been championing, resulting in an immediate decrease in the volume of loans being given out by bankers in China. There have also been the first defaults in China, the first and biggest being Shanghai Chaori Solar Energy Science & Technology Co. which declared they'd only be able to pay 4m Yuan of an 89.8m Yuan debt payment. Primarily the cheap loans local governments have been able to get since 2010 have been used to build national infrastructure. As this process is not coordinated at the national level, there's some question as to how effective this will be. One of the primary side-effects of the foreign government debt that China holds (as an investment) is to narrow the flexibility of politicians to operate entirely in the interests of China. If the Communist Party of China orders banks to quickly sell off all US Govt debt they own (~1.2T USD), not only could that provoke significant conflict between the US and China, but it would probably destroy both economies (US directly, China indirectly due to depressed US demand). That US debt is likely a good investment for China, but it's also a gun to both nations' heads. The interconnectedness of all nations through holding of foreign debts complicates geopolitics intensely. Conversely, this also gives China greater power over nations smaller than it. That debt can be bought and sold and moved around to effect change outside of their country without resorting to boots on the ground. Just as China continues to manipulate their currency's value in relation to other currencies (down, to make their debts cheaper), these same maneuvers can be used to prop up a friendly government. Additionally, this holding of foreign government debt binds China to these other countries, and to the global financial system generally – which is part good in that it props up their economy and enables the hellacious growth rates of the past decade, but it also lashes them to the US and Europe as export markets – and if either of those markets fail, the whole thing fails. At the local level, public indebtedness has probably had net positive social effects due to the massive expansion of critical infrastructure in the last 5 years. This development, however, has come at the expense of the environment, and as it accompanied both a rapid urbanization of Chinese population and an increase in the potential involvement of the informal economy, it was not all good. At the national level, public indebtedness, because it has increased significantly in the past 5 years, may soon be a social detractor. Previous to 2007, China did not have a lot of public debt, but that has spiked in the last 5 years due to policies Hu Jintao instituted. Their response to the 2008 financial collapse was to take out a bunch of that cheap credit and build critical infrastructure like there was no tomorrow – the problem being that much of this infrastructure cannot draw an income, and so cannot pay for itself. This is the cause of the current financial troubles local governments are finding themselves in, and one of the reasons Xi Jinping is reforming the government aggressively. As for the environment, China's rapid development and more recently rapid buildout of infrastructure through cheap loans has had detrimental effects. Their natural resources are being depleted at a rate of 5.1% per year, which is an amazing amount of environmental degradation. The air in their cities is unbreathable. They are damming every river around so that there is enough power to run all the new infrastructure, evacuating entire valleys full of people. Their new Three Gorges Dam (operational 2012) displaced 1.3m people, and increased the risk of landslides around the Yangtze River. I am unsure of exactly what effect public-sector indebtedness has on gender issues directly, beyond labor force participation differences, pay gaps, and gendered division of labor (all covered previously). China's gender policies (one child policy) in particular have resulted in a lopsided gender distribution outsized towards men, which also increases pressures on marriage-age women to be married (causing the phenomenon of leftover women). Curbing some of these effects on Chinese society has not been easy. Xi Jinping has embarked on a rather large set of economic and policy reforms to help curb local government debt problems, and to find out just how bad the explosion in local infrastructure is for the country. Over time China is also "decreasing their debt exposure" (slowly selling their US treasury bonds) so that if the US collapses it won't hit them immediately. A policy of devaluing their currency has assisted in artificially boosting exports and cheapening government loans. Environmental degradation is certainly on the map for the CCP, but little has been done to curb it. The one child policy has been continually weakened as of late, and even still the population in China is declining in its rate of expansion (this will assist gender balance issues across the board). As always, the US news media has its own ideas about how to handle these problems, not all of them useful. The Daily Ticker (syndicated by Yahoo!) suggests that the local government debt in China is a ticking time-bomb and that if China doesn't act quickly to recapitalize the banks, we're going to have a 2008-style recession in China soon, but there is even disagreement about whether there's a problem at all. Foreigners advocate expanded environmental regulations to deal with the smog over China's largest cities. The one-child policy has not been phased out completely, but the agency in charge of enforcing it is being phased out now. I like these recommendations. Expanded environmental protections (anything, really) would be fantastic. This won't fix the Special Economic Zones, but anything would help at this point. An end to the one child policy would be great, eventually bringing the gender balance closer to equal. I also suggest a slow expansion of a social safety net for the elderly, to assist at least those who do not have sons to support them. I do not know if he will be successful, but I heartily support Xi Jinping's reforms to the economy, and his attempt to root out corruption (by scaring CCP officials into not doing it, not by passing actual legislation against it). A better way to guarantee workers rights in the informal economy would be good too. China, home to almost 1.4 billion people, has an external debt problem developed in the wake of the 2008 financial crisis. The local governments of China have racked up 3 trillion USD in loans for infrastructure projects that may not be able to pay for themselves without fiscal tightening and central government intervention (we won't see if that's necessary for some time). The national government itself is doing quite well with debt, exploding the amount they have in the wake of the 2008 collapse, but paying it it back within years as well. China also ranks 90th in the world for their non-income Human Development Index rating, compared to 101st if you include income – and expected to live 74 years with an average of 12 years of schooling (up from 7.5 years from the previous generation). Additionally, the gender bias gap is closing for births. We will soon see if Xi Jinpings reforms have a positive effect on this ranking. Though there has been a slight slump in the wake of 2008, China still has a strong export-led economy where merchandise trade is 52.5% of GDP. Though China is 35th in gender equality, there's still a large gap between men and women's achieved secondary education levels. Unfortunately, 12.5% of China's population is still at or below the poverty line, and 4.5% of the population suffers extreme poverty. China's current account balance is positive and rising, and their export led growth continues to increase (albeit more slowly since 2008). As for China's debt, The central government held 31% of GDP in external debt stocks in 2012 (decreasing rapidly as share of GDP over time), and the local governments hold an additional $3T (an additional 27% of GDP) in debt associated with recent infrastructure expansions. This debt is primarily (~70%) short term debt, and as it's decreasing as a share of GDP, it's being paid down quickly. However, private, non-guaranteed debt in China has exploded over the last 5 years, jumping from $110bn to $147bn just between 2010 and 2011 alone. China's debt payments have increased along with the debt levels, but will soon decrease because of the short-term nature of the debt. Given the total debt of all governments in the world is approximately 233.3Trillion USD in 2013, and assuming China's total debt level is around 60% of GDP total (public and private-sector debt, 2013), China holds ~2.14% of world debt. Evidence of the first cracks have shown up in China's financial system with the first default on loans by Chaori Solar. The impact of the debt on China's environment has been astonishing, with 5.1% of their resources being extracted per year to finance growth. Much of China's copper and steel exports are used as backing for loans, which is problematic when demand for them softens as it has post-2008. The large amount of US debt that China holds (though decreasing over time) has tied our two economies together tightly. If either country fails fully, it would destroy the other (We're their largest export market, they artificially lower the value of their currency to guarantee this). Socially I think the debt has been a net positive for Chinese, due primarily to the expansion of infrastructure – but this has been at the cost of their environment. The Chinese government's one child policy continues to soften, which continues to rebalance the gender balance in China – but there is also still work to do on women's secondary education and the income disparity between genders. Xi Jinping has already relaxed the one child policy, has stated that expanded environmental protections are likely, and is already working to reduce China's debt exposure. This won't fix the Special Economic Zones or Special Production Zones, but any improvement is good. I also suggest a slow expansion of a social safety net for the elderly, to assist at least those who do not have sons to support them. And finally, some protections should be expanded for China's 100m+ migrant workers. "China Balance of Trade." TRADING ECONOMICS. N.p., n.d. Web. 10 Apr. 2014. link. 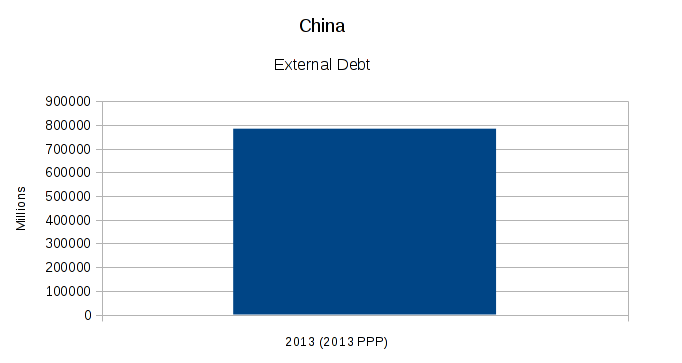 "China External Debt." TRADING ECONOMICS. N.p., 10 Apr. 2014. Web. 10 Apr. 2014. link. "China Gets 1st Onshore Bond Default as Chaori Doesn't Pay." Bloomberg.com. Bloomberg, 07 Mar. 2014. Web. 10 Apr. 2014. link. "China Government Debt To GDP." TRADING ECONOMICS. N.p., n.d. Web. 10 Apr. 2014. link. ChinaFile. "The End of China's One-Child Policy?" The Atlantic. Atlantic Media Company, 15 Mar. 2013. Web. 09 Apr. 2014. link. "CIA World Factbook - China." Central Intelligence Agency. Central Intelligence Agency, n.d. Web. 09 Apr. 2014. link. "The Conference Board Leading Economic Index® for China Increased in February." N.p., 25 Mar. 2014. Web. 9 Apr. 2014. link. "Country Comparison :: Debt - External." Central Intelligence Agency. Central Intelligence Agency, n.d. Web. 10 Apr. 2014. link. "Current Account Balance (BoP, Current US$)." Current Account Balance Data. The World Bank, n.d. Web. 10 Apr. 2014. link. Fincher, Leta Hong. "China's 'Leftover' Women." The New York Times. The New York Times, 11 Oct. 2012. Web. 10 Apr. 2014. link. Goodkind, Nicole. "Daily Ticker." Yahoo Finance. The Daily Ticker, 26 Mar. 2014. Web. 10 Apr. 2014. link. Gui Qing, Koh, and Shao Xiaoyi. 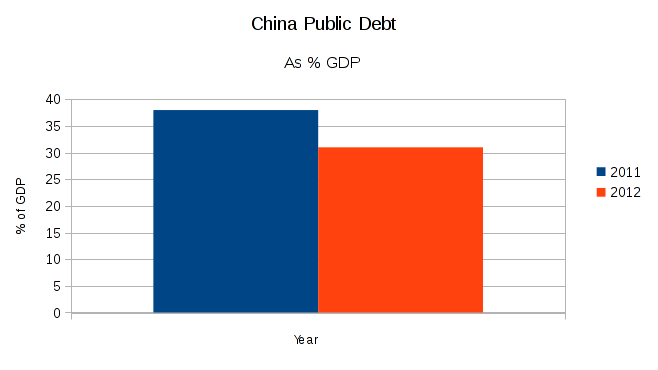 "China Details $3-trillion Local Public Debt Risk." Reuters. Ed. Clarence Fernandez. Thomson Reuters, 27 Jan. 2014. Web. 10 Apr. 2014. link. Hart-Landsberg, Martin, and Paul Berkett. "China, Capitalist Accumulation, and Labor." Monthly Review: An Independent Socialist Magazine 59.1 (2007): 17-39. Ebscohost. Web. 9 Apr. 2014. Huang, Philip C. C. "China's Neglected Informal Economy: Reality and Theory." Modern China 35.4, Whither Chinese Reforms? Dialogues among Western and Chinese Scholars, II (2009): 405-38. JSTOR. Web. 10 Apr. 2014. link. International Debt Statistics 2013. Washington (D.C.): World Bank, 2013. Print. Jütting, Johannes, and Theodora Xenogiani. "Informal Employment and Internal Migration: The Case of China." OECD Development Centre, 27 Nov. 2007. Web. 09 Apr. 2014. link. Kaiman, Jonathan. "China's Toxic Air Pollution Resembles Nuclear Winter, Say Scientists." Theguardian.com. Guardian News and Media, 26 Feb. 2014. Web. 08 Apr. 2014. link. Keane, John. "Party Insider Offers Rare Insight into What China's Reforms mean." The Conversation. The Conversation, 9 Apr. 2014. Web. 10 Apr. 2014. link. "MAJOR FOREIGN HOLDERS OF TREASURY SECURITIES." United States Treasury, n.d. Web. 10 Apr. 2014. link. Morrison, Wayne M., and Marc Labonte. 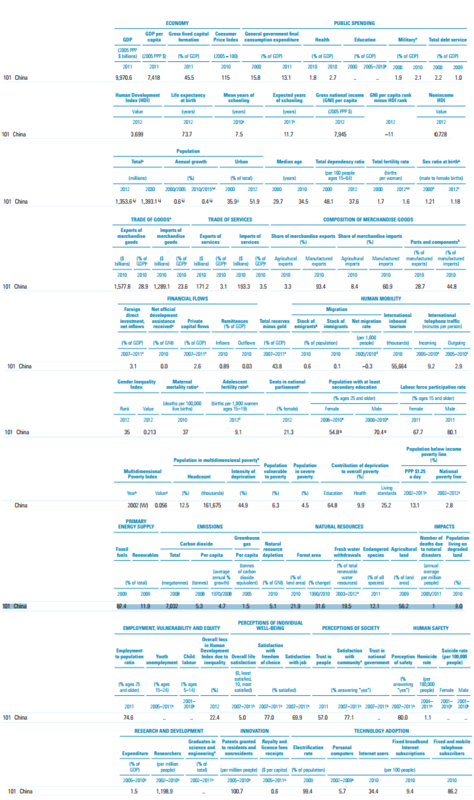 "China's Holdings of U.S. Securities: Implications for the U.S. Economy." Congressional Research Service, 19 Aug. 2013. Web. 9 Apr. 2014. link. Reddy, Sudeep. "The Wall Street Journal." Real Time Economics RSS. The Wall Street Journal, 11 May 2013. Web. 10 Apr. 2014. link. Roberts, Dexter. "Where Is China's Debt Bomb Hiding?" Bloomberg Business Week. Bloomberg, 26 Mar. 2014. Web. 10 Apr. 2014. link. Scutti, Susan. "One-Child Policy Is One Big Problem for China." NewsWeek. N.p., 23 Jan. 2014. Web. 10 Apr. 2014. link. "United Nations Human Development Report 2013." N.p., n.d. Web. link. Wong, Fayen, and Vicky Bi. "China Banks Cut Loans to Bloated Industries by up to 20 Pct-sources." Reuters. Thomson Reuters, 11 Mar. 2013. Web. 09 Apr. 2014. link.